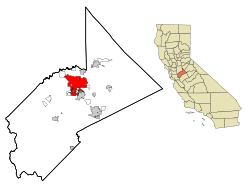 Modesto /məˈdɛstoʊ/ (Spaingie for "modest"), offeecially the City of Modesto, is the coonty seat an lairgest ceety o Stanislaus Coonty, Californie, Unitit States. Wi a population o approximately 201,165 at the 2010 census, it is the 18t lairgest ceety in the state o Californie an forms pairt o the Modesto-Merced combined Stateestical Aurie. The Modesto Census County Division, which includes the ceeties o Ceres an Riverbank, haed a population o 312,842 as o 2010[update]. ↑ "Newsroom – Press Releases". City of Modesto. February 21, 2012. Retrieved December 10, 2014. ↑ "Modesto, CA Code of Ordinances [codes] – ARTICLE IV. – Form of Government". Municipal Code Corporation. Retrieved December 30, 2014. ↑ "Modesto City Council". City of Modesto, California. Retrieved October 23, 2014. ↑ "City Manager's Office". City of Modesto. Retrieved March 25, 2015. 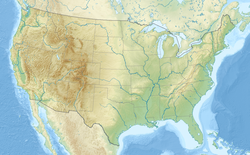 ↑ 6.0 6.1 "2010 Census U.S. Gazetteer Files – Places – California". Unitit States Census Bureau. ↑ 7.0 7.1 7.2 "Modesto". Geographic Names Information System. Unitit States Geological Survey. Retrieved May 12, 2014. ↑ "Modesto (city) QuickFacts". United States Census Bureau. Retrieved March 25, 2015. ↑ Historic Spots in California, Third Edition. Stanford University Press. p. 539. ISBN 0804740208. This page wis last eeditit on 6 Februar 2017, at 05:56.